Kota is an ancient city of Rajasthan, dating back at least to the 12th century. It lies along the mighty Chambal river. 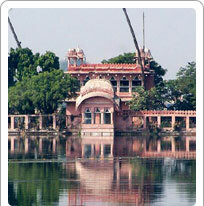 The beautiful Jag Mandir Palace was built in 1740 by a Maharani (Queen) of Kota. Situated in the midst of the artificial lake Kishore Sagar made by Prince Dher Deh of Bund in 1346 AD, it stands as a testimony to the architectural and engineering skills of ancient and medieval India. The beauty of the red-sandstone building that is even now in an excellent condition, is enhanced by the calm waters of the lake. A boat ride here is an enjoyable experience. Other excursion nearby can be made to the Keshar Bagh, famous for its royal cenotaphs. Kota is an ancient city of Rajasthan, dating back at least to the 12th century.